Some of the best and most popular snow cone flavors are those that feature a fruity taste. If you want authentic flavor, try Hawaiian Shaved Ice�s black cherry snow cone syrup. This product is so incredibly tasty and fruity that you�ll feel like you�re eating a real black cherry. With its deep, dark red color, our black cherry shave ice syrup creates a stunning finished product that will certainly impress your friends and family. Whether you�re having friends over for entertaining or just having a fun night at home with the family, this black cherry snow cone syrup is a wonderful way to create a unique and delicious experience you�ll never forget. 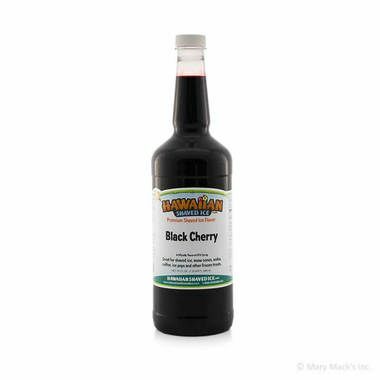 Order this black cherry shave ice syrup from Hawaiian Shaved Ice as part of a flavor multi-pack in order to save on your purchase. If you can�t get enough of this syrup, it�s also available in gallon size. You can select this black cherry snow cone syrup as part of your purchase along with other fun, fruity flavors.